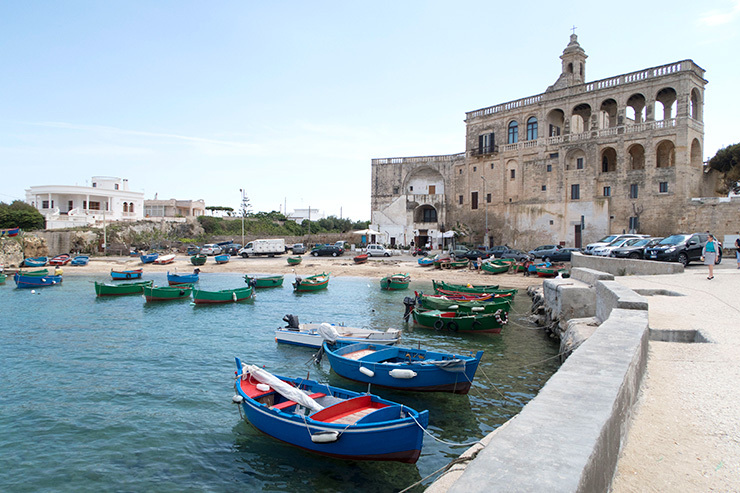 Anyone who knows me well knows that I have always loved Puglia. 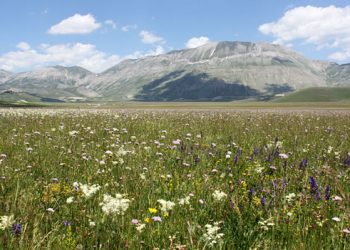 In fact, I often even say that if I didn’t love Umbria so much, the region of Puglia would be my next choice of a place to live. 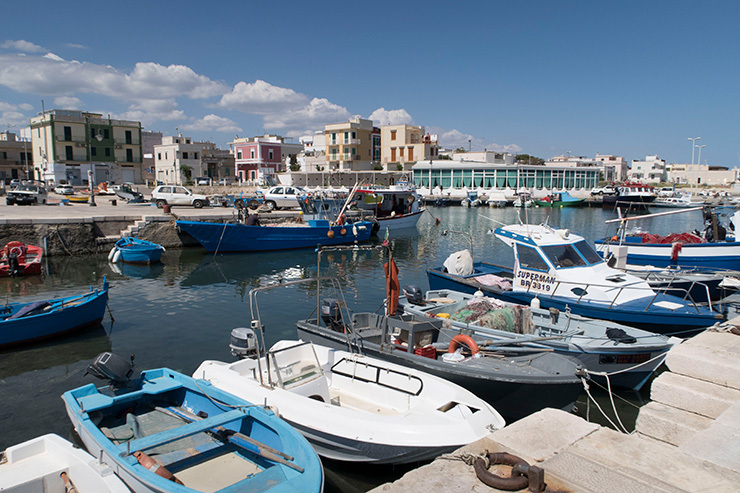 It is such a unique region surrounded by water, its cuisine is spectacular, its people warm and friendly, and Puglia has so many amazing places to explore. We have been talking with friends about putting together a cycling trip through Puglia for a number of years, and this year the dream was finally realized. My husband and his cyclist friends apparently love challenges, as in the past they have already ridden from Provence to our place in Umbria, two years later rode around the entire island of Corsica, and then last year they rode the major climbs in Provence before riding across the French Alps. 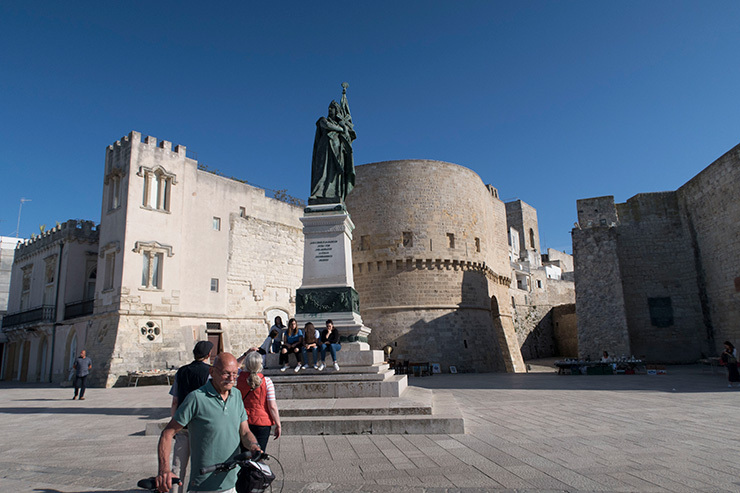 The “Puglia plan” was to meet in Bari, then ride around the coast of Puglia, through Matera in Basilicata, into Abruzzo, then Le Marche, and finally home to Umbria. 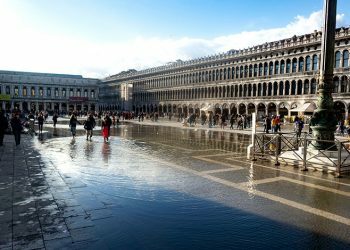 Since this was such a major undertaking to co-ordinate, we contacted Antonello Losito, and his team at Southern Visions Travel to put it all together for us. A trip this huge requiring so many detailed plans required the help of professionals. After a few unexpected complications, we ended up with eight cyclists and six non-riders, aged fifty-six to seventy-seven. It was a huge endeavor to put together a trip that met everyone’s needs, but Southern Visions pulled it off better than we ever could have hoped for. On past rides, us non-riders simply followed the cyclists in our cars, stopping here and there to visit local landmarks along the way when we could fit them in. This trip not only put together challenging rides for the cyclists, but had plans every day for us non-riders so we could also get a complete Pugliese experience. 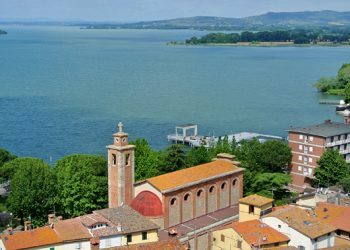 As Antonello stated at the beginning, this trip would cover 1450km on wheels, include six different regions to explore, had three vessels to conquer, six picnics, three islands, one trailer, fourteen guests, one stage at the Giro d’Italia and thirteen days on the road. It truly was an experience of a lifetime and we will hold these memories close for years to come. 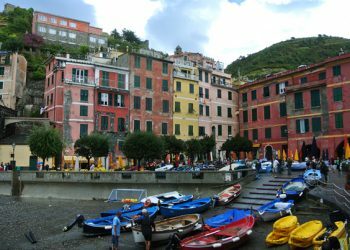 The people, the towns, the lodgings, the wine, the scenic views, and especially the FOOD! The food we enjoyed in Puglia was so fantastic that it truly needs a post of its own, so when I finally tackle all thirteen days of our travel, I will share the many, many amazing Pugliese dishes we enjoyed on our trip. 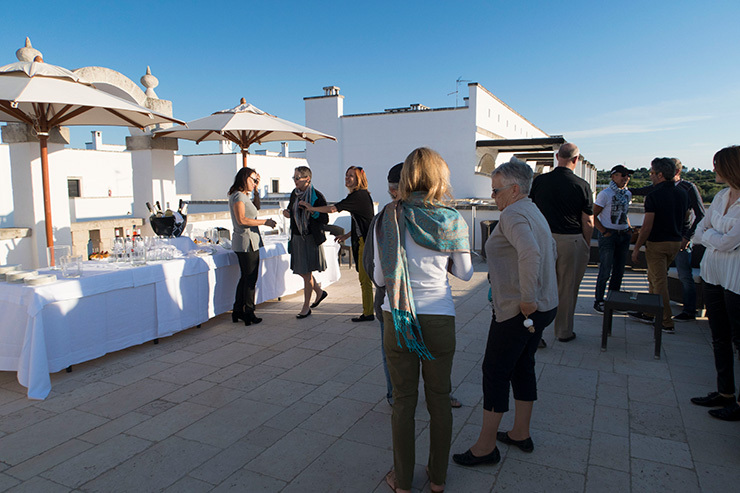 I will do my best to share our experience with you because I do have many hotels, restaurants, towns, and wineries that I want recommend to anyone visiting Puglia. 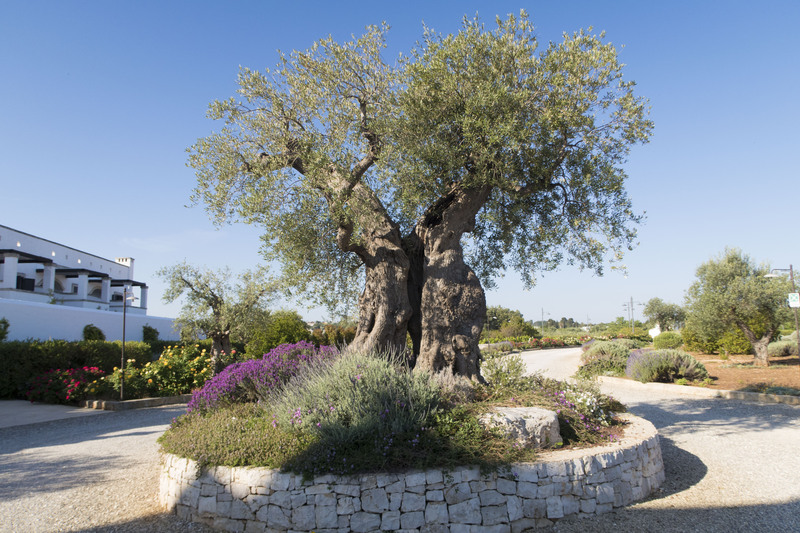 I’ll do my best to keep it short, but I have collected a lot of information along with over 1,500 photos, with at least fifty photos of olive trees over a thousand years old! To keep this information overload reasonable, I will divide the posts to three days at a time. 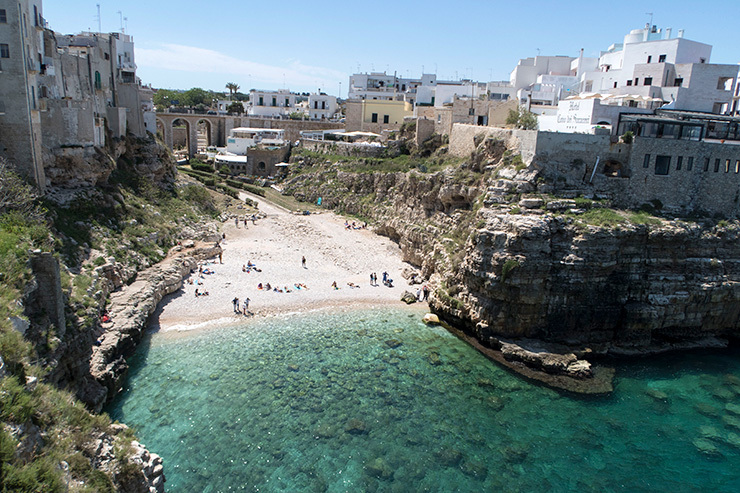 My husband and I headed down to Puglia the day before the official start of the trip to meet with Antonello and his team and to visit a couple of our favorite spots before the rest of the group arrived. 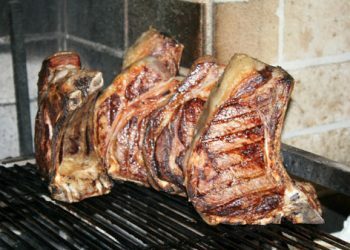 We made reservations at a highly rated restaurant in Trani called Quintessenza for lunch the day we arrived in Puglia. The meal was elegant and delicious, though the portions were minimal. We just ordered two courses each not wanting to eat too much at lunch, but for the price, I’d highly recommend the tasting menu. We checked into our hotel Borgobianco Resort and Spa just outside of Polignano al Mare where we would spend the next three nights. The hotel was lovely, the rooms very comfortable, and the common grounds covered in flowers. For dinner, at Antonello’s suggestion, we tried something a little different and ate at Bracceria Da Matteo in Triggianello, just outside of Polignano al Mare. You choose your meat at the butcher’s counter, then sit down and order your sides while they grill your meat for you. It was a very inexpensive and tasty meal, and although it was a little difficult to find, we thoroughly enjoyed the experience. 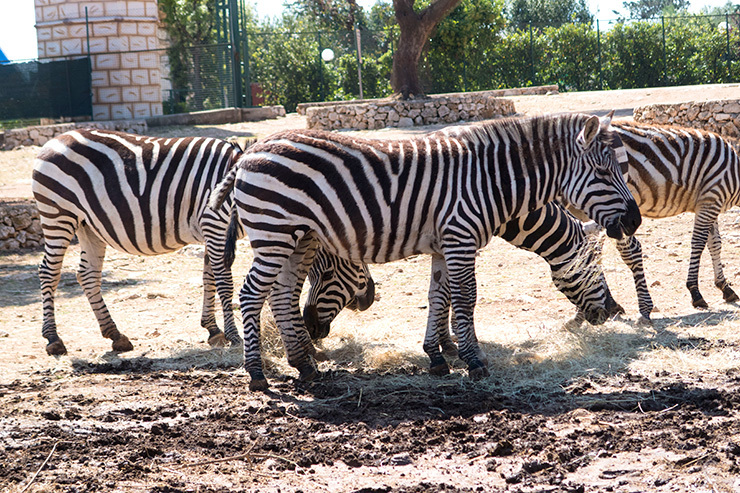 The next day we went to visit Zoo Safari outside of Fasano. In recent months, I became enamored with April the giraffe live cam on Youtube, and eagerly anticipated the birth of her calf along with millions of others around the world. Because of this, I wanted to see and feed giraffes in person, and once I read that Bari had an animal safari where you drove through the park with the animals that walked right up to the car, I talked my very patient husband into taking me there. Although I would describe it as a little run down, I thoroughly enjoyed interacting with the giraffes, and I think it would be a great experience for children. After getting my giraffe fix, we headed over to Torres Cannes to our favorite “fish shack” L’Oasis del Riccio for an inexpensive and thoroughly delicious seafood lunch. 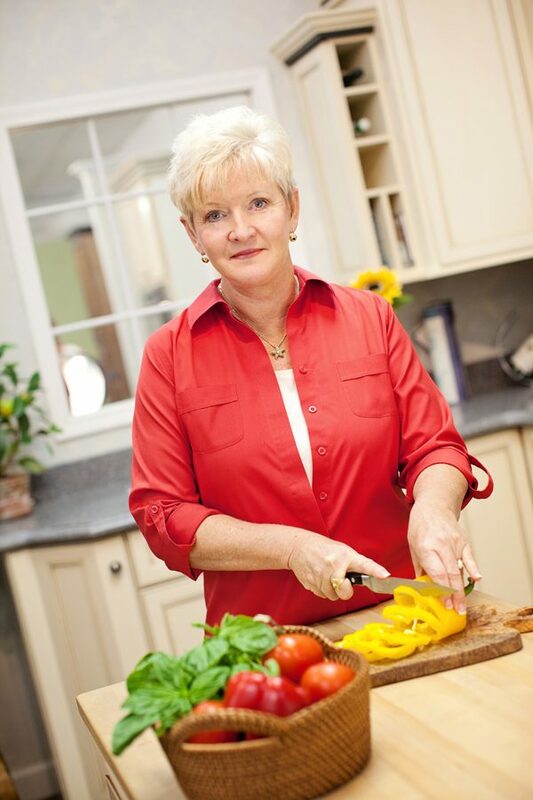 We have been frequenting this family run establishment for many years and have never been disappointed. Luckily they even had ricci di Mare (sea urchins) on the menu. 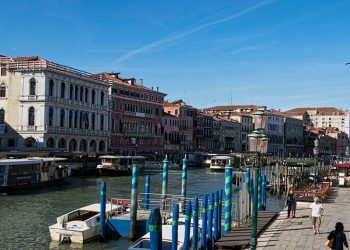 Later that day, the rest of the group arrived from the United States as well as France, and we had a get-together appetitivo session to discuss the trip with Antonello and Alison Pike from Southern Visions. Up Close & Personal With The Animals At Zoo Safari. 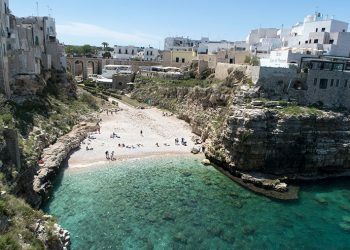 While the cyclists went off on a leisurely ride for some to try out their rented bikes and others to get the feel of riding the roads of Puglia, the six non-riding ladies were met by Max and spent a couple of hours on a private boat discovering the sea caves of Polignano al Mare. 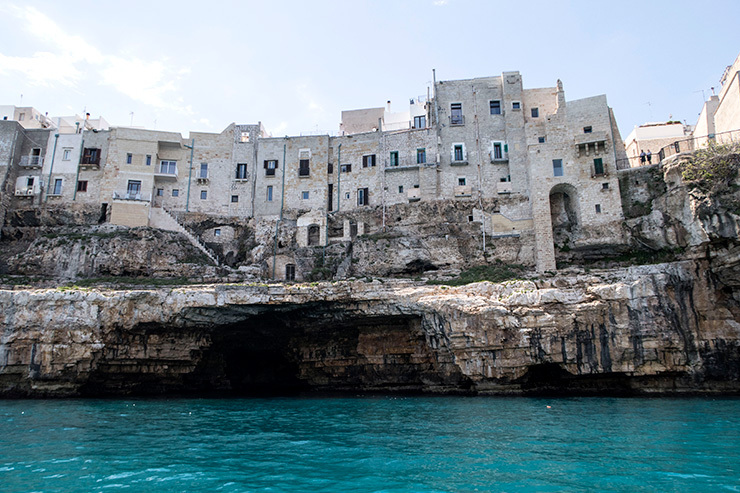 The boat took us into a number of larger caves, and we had the experience of viewing the wonderful town of Polignano al Mare from the sea. Although I had visited Polignano a number of times in the past, you do not get a real feel for how the town sits perched on the cliffs until you see it from the sea. We even were treated to a glass of bubbly inside one of the larger caves! 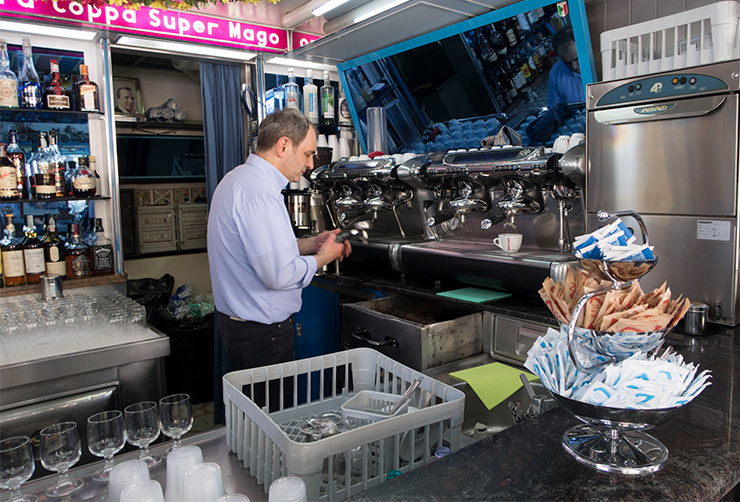 After our sea adventure, Max took us to Il Super Mago del Gelo Mario Campanella for the famous Caffe Speciale made with espresso, sugar, lemon peel, cream, and Amaretto liqueur. After moans of delight as we sipped our delicious coffee, we also got to share the pistachio gelato, which Polignano claims is the best in Puglia. Not being a pistachio gelato lover myself, I have to say that it was pretty darn good gelato! After our exploration of Polignano al Mare, Max then took us to San Vito, for lunch at Veranda di Giselda for a lovely seafood extravaganza. After some the freshest, tasty seafood appetizers, it was evident that there was going to be a problem as all the ladies were very full. We were each then brought an individual terrine of Tiella Barese, or Riso, Patate, & Cozze (rice, potatoes, and mussels) a very traditional Pugliese dish from Bari as our first course. We did our best to work our way through the course, but after seeing our difficulty in finishing this dish, the owner came over and asked if we didn’t like it and if we wanted something else instead. We expressed our sincere pleasure of the meal but stated we just couldn’t eat another bite. We were then told that they had planned on bringing us another course of grilled octopus and a fried seafood platter as a second course which we graciously turned down. I encouraged the ladies to at least try some desert so that we do not completely offend the owner, and we all shared three small chocolate lava cakes. Before the cakes arrived however, they brought us two plates of cookies that I quickly wrapped up in napkins and stuck in my purse. I just couldn’t disappoint the very concerned owner yet again! It was obvious after this meal that although the food was absolutely delicious, that women of a certain age used to eating minimally just couldn’t eat this much at every meal and we had to ask Antonello to reduce the size of our meals. After lunch, we all felt a walk was in order so we headed over to the the town of Monopoly for a stroll. Unfortunately, like most small towns across Italy, everything was shut down from 1pm until 4pm and the town was all but deserted. Dinner was a relaxed seafood based meal at Borgobianco, and everyone headed to bed early as the cyclists would be starting the more difficult rides the next morning. Our second scheduled day had the cyclist heading out for a ride towards Alberobello, while the non-riders were met by Silvia and taken to visit an artisan burrata, and mozzarella farm. The owner was very gracious to take us on a complete tour of his facilities, showing us the step by step procedure used to make mozzarella from cows milk. We even were able to get up close and personal with his small herd of milking cows and saw how the milking process takes place twice a day. After the tour, we were treated to a mozzarella, scamorza, and cured meat tasting inside the family home. Tasting mozzarella still warm from the factory was indeed a treat we all enjoyed. 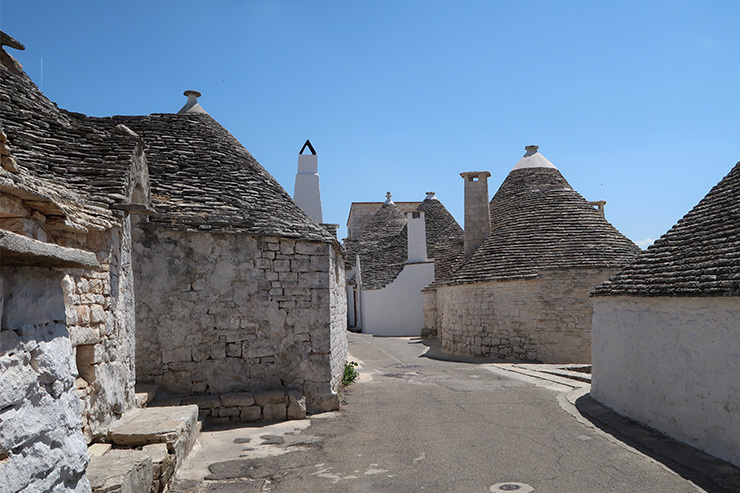 After leaving the mozzarella factory, we headed to Alberobello, the land of the trulli, or cone shaped houses. Silvia took us on a tour of the town, and after exploring the old town not often visited by tourists, we stumbled upon our cyclists who also stopped by Alberobello for a quick visit. We then all headed to Locortondo to Trullo Cardone winery to have lunch with the entire group. 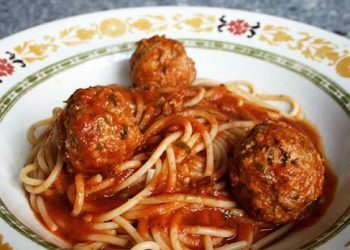 This time our meal was lighter and consisted of some vegetable-based appetizers, tasty cheese, and salumi platters, and a delicious bowl of homemade orecchiette with tomato sauce and tiny bread based meatballs. We tasted the cantina’s various wines with our lunch, then we headed off to the white town of Ostuni, and Masseria Il Frantoia, our next overnight stop. 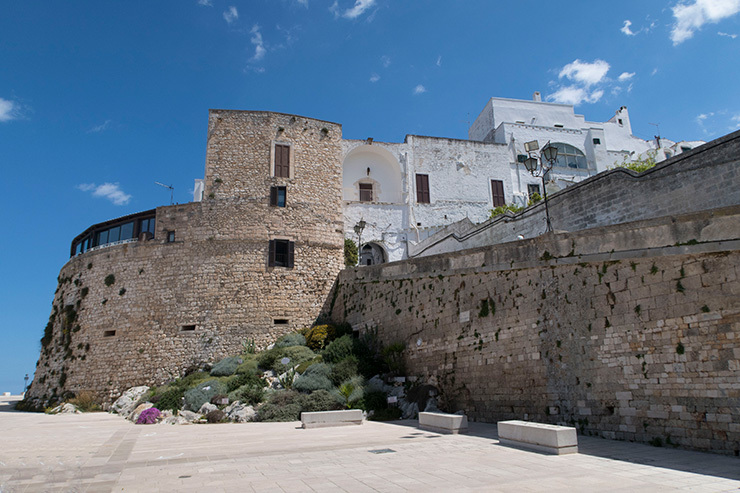 I took the position of being the lead car for the ladies on this trip, and although we did pretty good finding almost each and every location on our journey without too much difficulty, unfortunately my GPS gave me the run around finding Masseria Il Frantoia. 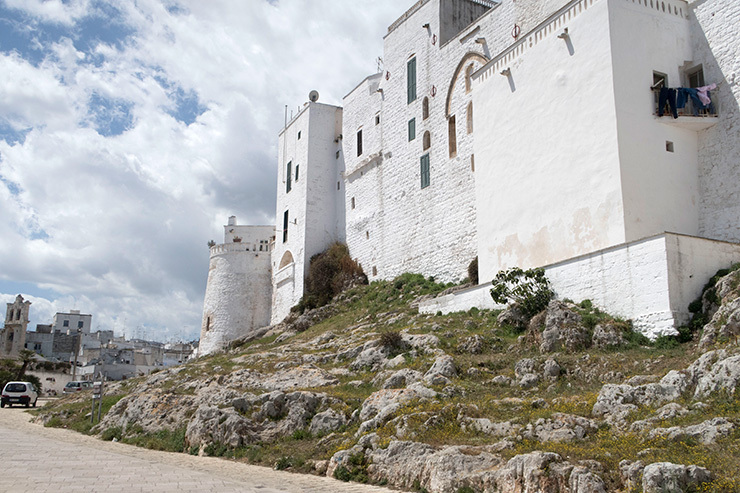 We made an unplanned scenic tour around Ostuni more than once before finally locating the masseria. We did finally make it to this historic masseria though, but by the time we arrived it was raining so we didn’t really get to appreciate it in the sunshine until the next day. Il Frantoia has been in existence since the fifteen hundreds, and is still a working farm to this day. The restaurant is well known for its farm fresh, biological multi-course meals, and I must admit that our dinner at Il Frantoia was one of my favorites of the trip. Before dinner, the charming farm manager took us all on a tour of the grounds, antique olive mill, and historic olive trees. We then sat down and worked our way through course after course of unique, delicious dishes created by local women who grew up learning how to prepare Pugliese specialties from their Mothers. 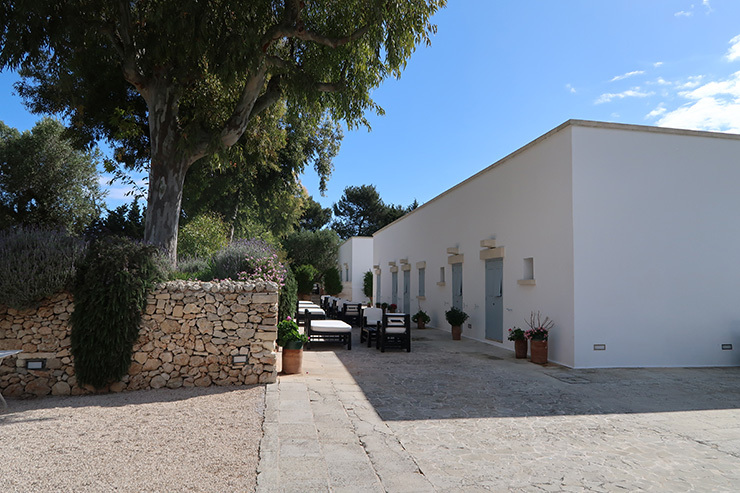 The masseria has just sixteen rooms, each different from the next. We were put into a room in the original building, and it was both large and very charming with traditional historic features intact. 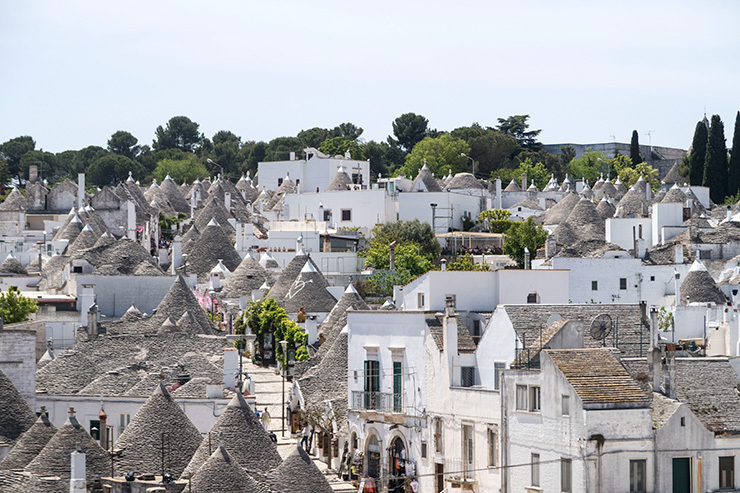 Trulli, the quirky cone shaped houses have become symbolic of the region of Puglia. These unique shaped homes date back to the Middle Ages. Originally the cone shaped roofs reached down to ground level, but in the 15th century they began to build them with the whitewashed walls we see today. The houses were used as homes for peasant farmers and were built the way they were because they stayed cool during the summer, but kept the heat in during the cooler months. Trulli can be found in the countryside around Martina Franca, Locorotondo, and Conversano, although the largest grouping of trulli is in the town of Alberobello which has been designated a UNESCO World Heritage Site. 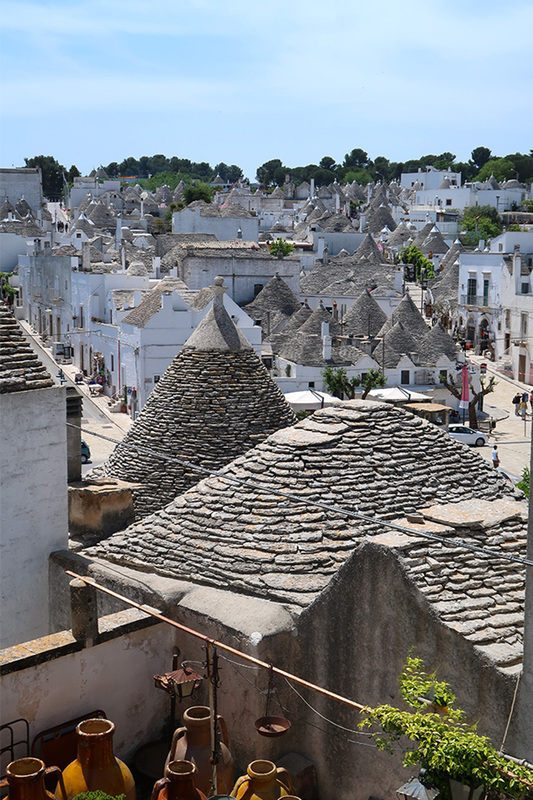 Alberobello today has over 1,000 trulli and many have been turned into bed and breakfasts, shops, and even restaurants. 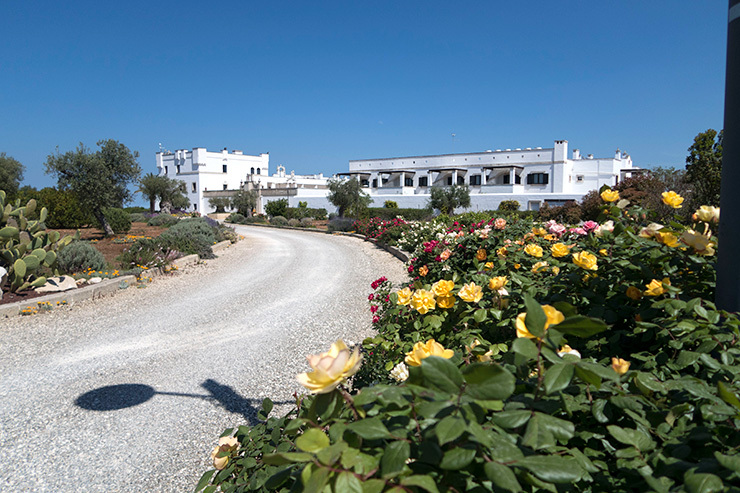 What exactly is a masseria? 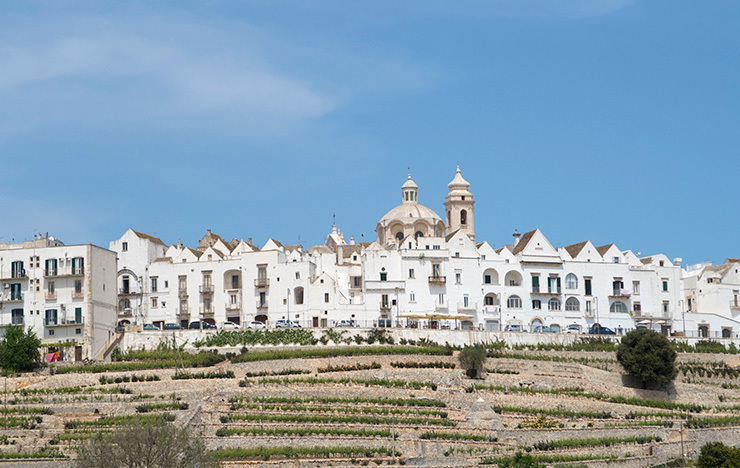 You will notice that we stay at a number of masserie (masseria is the singular form) on this trip. 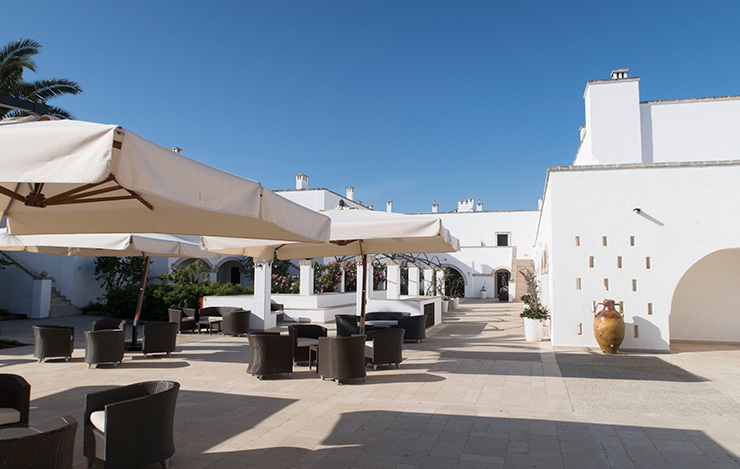 A masseria is a fortified farm house or country inn on an estate found in the region of Puglia. These lodgings can range from rustic to luxurious and most are set in working farms producing olive oil, wine, or other produce. You’ll usually find the masserie in country settings, and they are often white, one level, and have almost a Moorish look to them. 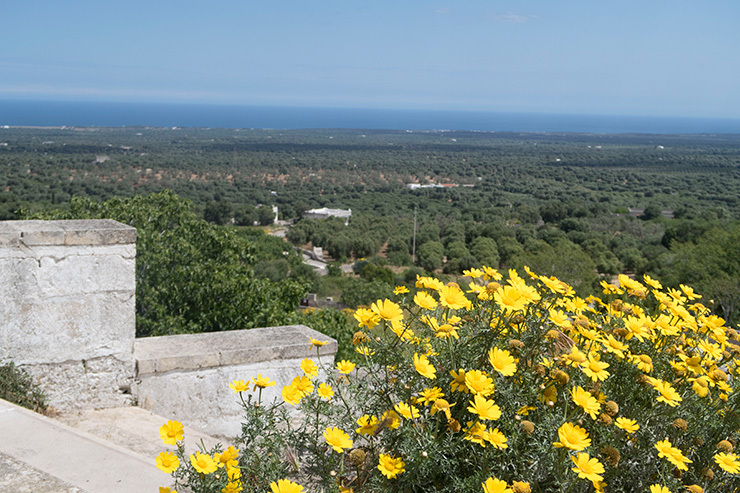 Masserie lodgings have become very popular in Puglia, and some are very luxurious and include spa facilities, swimming pools, complete restaurants, and other amenities. 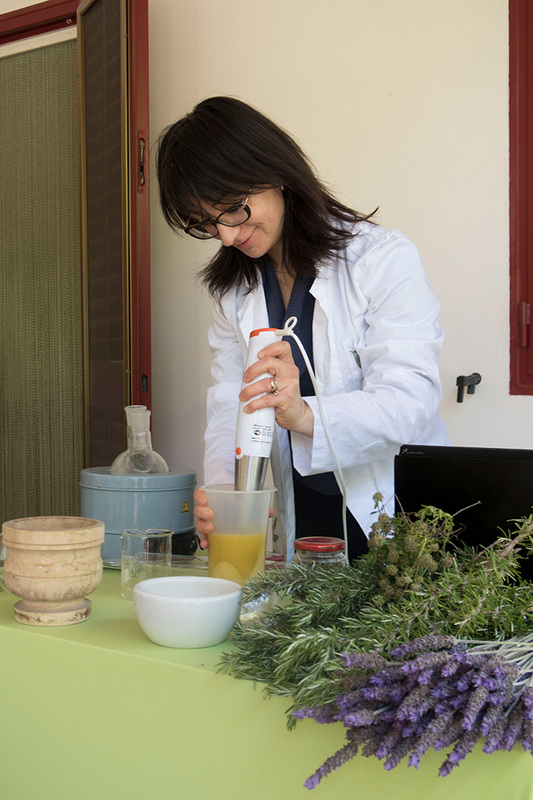 The riders headed off towards Acaya, while the ladies, or non-riders were met at Masseria Il Frantoia by Michele who led us to Ostuni to see a demonstration of olive oil soap making. 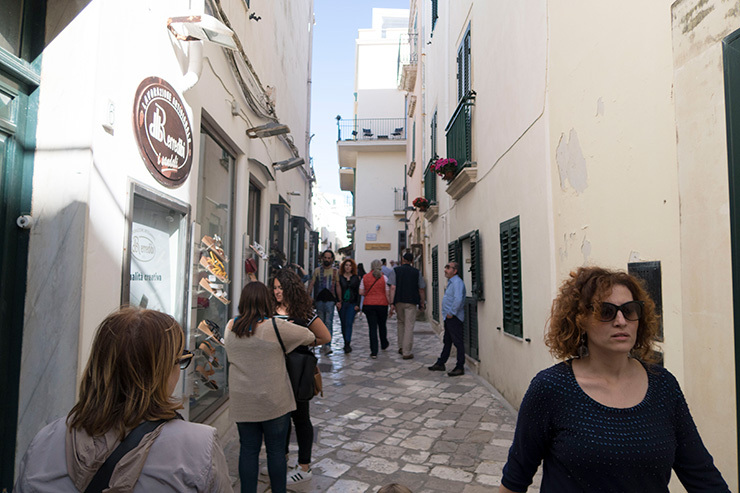 Afterwards, we headed to the center of Ostuni for a walking tour with Michele before taking an hour or two to shop and grab a quick lunch. 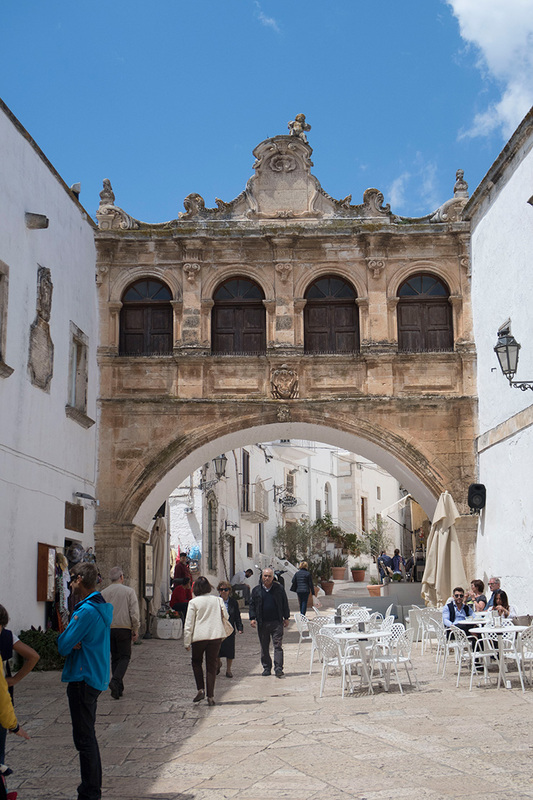 Ostuni has always been one of my favorites cities in Puglia because we have spent so much time there in the past. 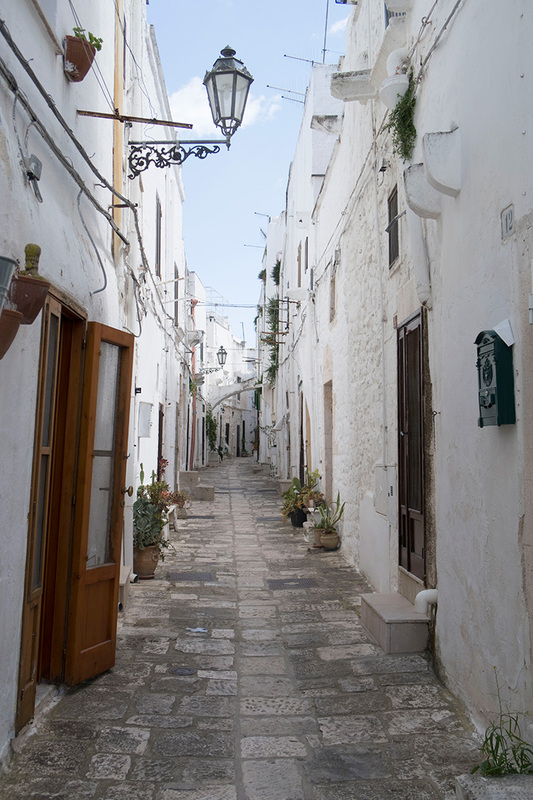 We have visited Ostuni at least five times over the years, and even once rented a large home with the family for an entire week just outside the city center. 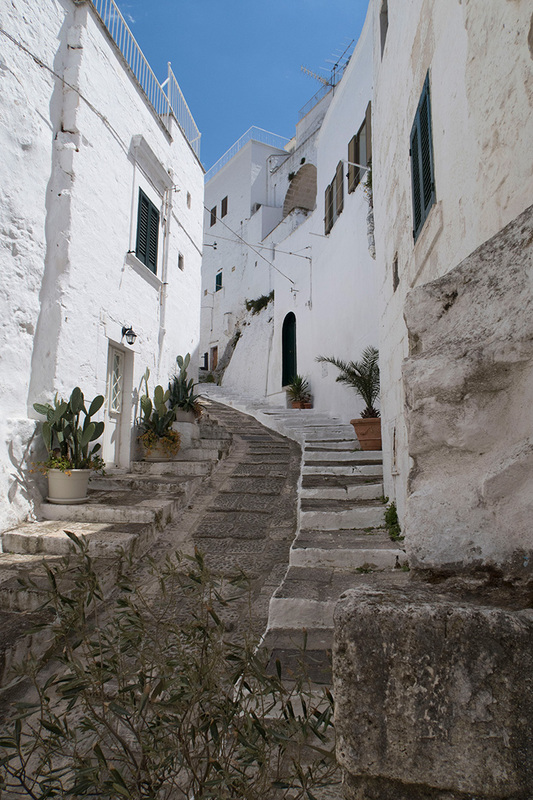 Ostuni is just one of Puglia’s famous whitewashed cities perched dramatically on a hilltop, and is most striking on a sunny day when everything white almost sparkles. 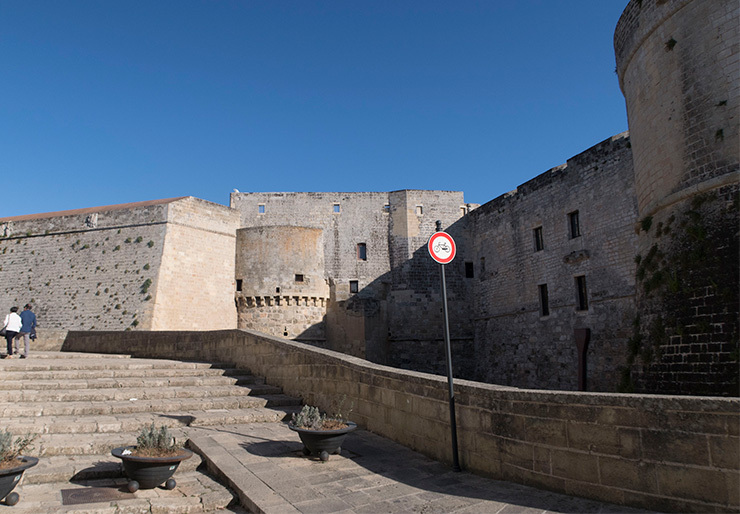 The old town is still surrounded by limestone walls that were used as a defense system throughout the years. After lunch, we headed off to Otranto, and Masseria Montelauro. 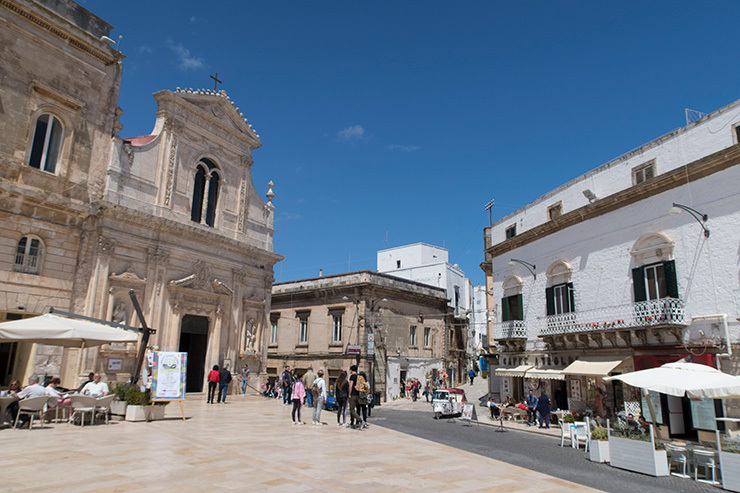 After checking in, some of us got into a three wheeled taxi of sorts which took us into the center of Otranto. There was an antique market in town that day, and being a Sunday afternoon, many local families were all dressed up and taking a passeggiata through town after lunch. 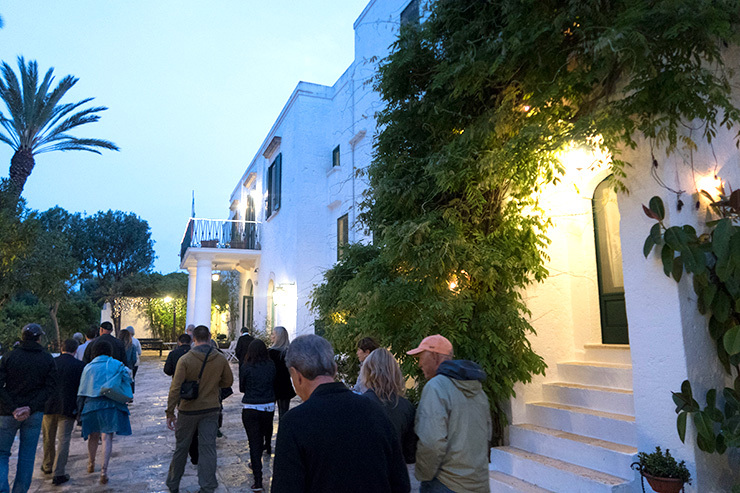 After spending an hour or two exploring Otranto, we headed back to Masseria Montelauro to clean up for dinner. We were first given a pasta making demonstration where two ladies quickly made homemade orecchiette and maccheroni. They allowed anyone interested to give it a try and we all learned how traditional Pugliese pasta is made. 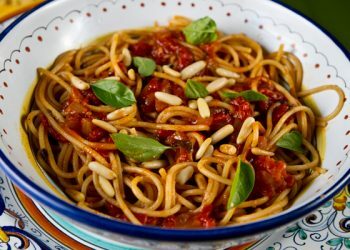 The ladies also explained that they often pair the two pasta varieties and top with a sauce, calling the pasta dish Maritati, or “married”. After yet another fun filled day, we enjoyed dinner at Masseria Montelauro before enjoying a much needed sleep. Continue Reading Days Four To Six! Beautiful photography! Sounds like a wonderful trip. Many thanks for sharing. Sounds like such a wonderful experience – thanks for sharing it with us! It was an amzing trip Denise! Wow, your group knows how to live — that’s what I love about Europe as a whole — people keep active no matter the age! 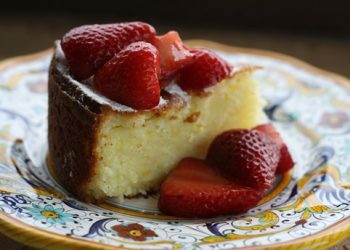 Look forward to Days 4 to 13 — the culinary tours (a bucket list wish) with Southern Visions sound amazing — thanks for sharing the pics/websites plus a bit of history too. We were told not to go there by our hosts. 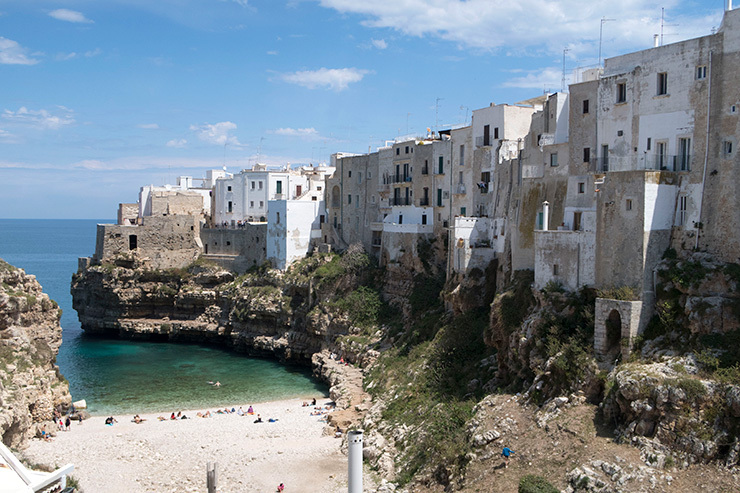 I’ve been to Polignano a number of times in the past and only heard bad things about this place. 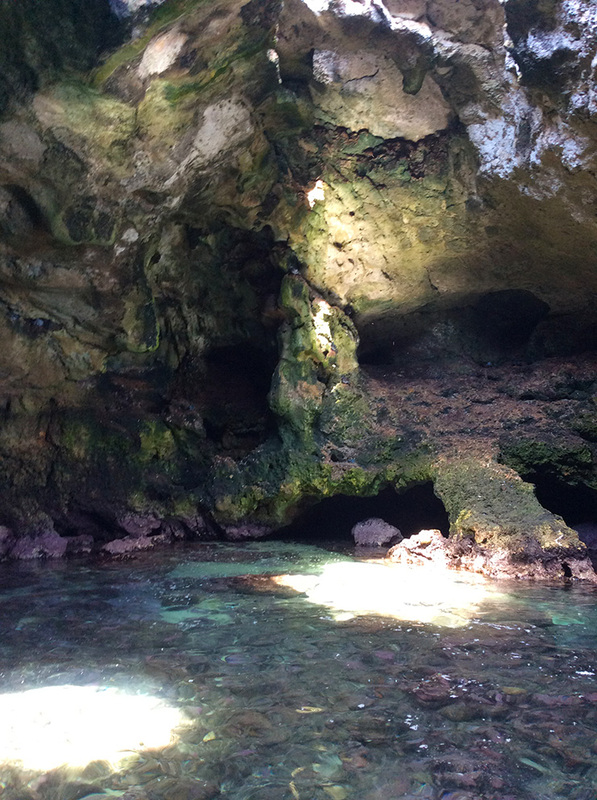 I did go into the cave where it is located by boat however. What a fabulous trip and what gorgeous pictures. Nicholas and I both like Puglia very much too. Thank you for sharing with everyone! For my food photos a Canon 5D with a 24-70mm lens most of the time. For my travel photos, I need a camera I can throw into my pocket to grab photos whener I can so I have recently bought a Canaon G7X. Would prefer using my big camera for all my photos but it is too heavy to carry around. I agree Tom, it is an amzing region! 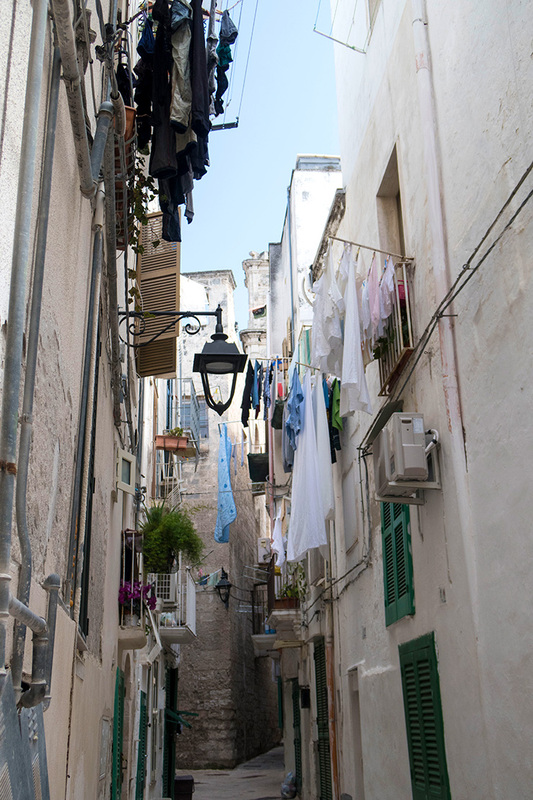 Thanks for posting your trip to Puglia. 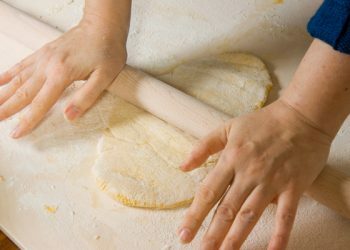 I first learned about Italy’s bread basket from Mario Batali & Lynn Rosetta Kasper. Those orrichietti look so easy to form but are not!